Kindergarten is a preschool educational approach traditionally based on playing, singing, practical activities such as drawing, and social interaction as part of the transition from home to school. The first such institutions were created in the late 18th century to serve children whose parents both worked out of the home. As of 2015, about 3.64 million children were enrolled in public kindergartens in the United States, and another 428,000 in private ones. A lot of families struggle to afford quality child care. With child care costs for an infant in a center amounting to about 16 percent of the median income in Colorado and for a school-aged child to 12 percent in the state of New York in 2015, parents are faced with great economic struggles. 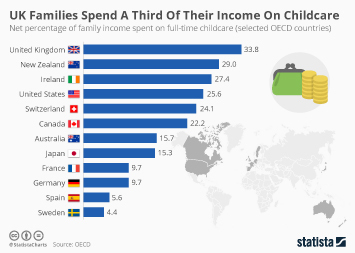 Child care has generally become less affordable for the majority of families living in the United States; however, for many low-wage workers child care is out of reach. In 2014, about 65 percent of children under 5 years had child care arrangements outside center-based care. Statistics show that despite the recent decrease in the number of children enrolled in full-day pre-primary schools, the share of children enrolled in full-day pre-primary school programs remains relatively higher than the percentage of children enrolled in part-day pre-primary school programs in the United States as of 2013. Many parents work long hours or struggle between two jobs to afford child care, therefore they prefer full-day programs. A connection can also be made between the parent or guardian’s level of education and the type of enrollment (full-day or part-day) they chose for their children. The highest share of children enrolled in full-day pre-primary school programs in the U.S. was associated to parents or guardians with the highest levels of education . Parents with higher levels of education usually have jobs which require greater amounts of working hours and effort and are therefore deprived of time to care for their children.